Magic is a feature of countless myths and fantasy stories, and hence has been studied by quite a few academics – as well as by many would-be magicians. The following is just a small selection of inspirations and references. For further reading, see the bibliography of GURPS Fantasy. Clute, John and Grant, John. The Encyclopedia of Fantasy (St. Martin's Griffin, 1999). Encyclopaedia Britannica. Now available on DVD, online, or even on paper. Kieckhefer, Richard. Magic in the Middle Ages (Cambridge University Press, 2000). Blish, James. Black Easter (Dell, 1969); The Day After Judgment (Penguin, 1974). Diabolical ritual magic in the modern world. Both novels appear in The Devil's Day (Baen, 1990). Clarke, Susanna. Jonathan Strange & Mr. Norrell (Bloomsbury, 2004). Witty fantasy set in an alternate Napoleonic era. The title characters are responsible for the restoration of a lost tradition of "English magic," which exhibits the vast power and maddeningly arbitrary limitations of magic in fairytales. Gaiman, Neil. The Books of Magic (DC Comics, 1990-1991). Four-part comic-book series defining the history and nature of magic in DC's superhero universe. Garrett, Randall. Lord Darcy (Baen, 2002). Omnibus edition of the "Lord Darcy" stories: detective fiction set in an alternate history with ritualistic magic that obeys well-determined rules. Jones, Diana Wynne. Chronicles of Chrestomanci (Eos, 2001). Three-volume collection of the "Chrestomanci" stories. Two houses, both alike in magery . . .
LaBan, Terry. Muktuk Wolfsbreath, Hard-Boiled Shaman (DC/Vertigo, 1998). Three-part comics series about a Siberian shaman, told in hard-boiled thriller mode. Le Guin, Ursula K. A Wizard of Earthsea (Parnassus, 1968); The Tombs of Atuan (Atheneum, 1971); The Farthest Shore (Atheneum, 1972). Classic fantasy trilogy featuring powerful name-magic balanced by a philosophy of restraint. Pratchett, Terry. Sourcery (Gollancz, 1988); Witches Abroad (Gollancz, 1991). Just two of the lengthy and still-growing "Discworld" series, which features a great deal of entertainingly depicted magic. Sourcery is about unlimited, world-wrecking powers. Witches Abroad shows how the setting's version of witchcraft is related to the power of stories to make themselves come true. Rohan, Michael Scott. The Anvil of Ice (William Morrow, 1986); The Forge in the Forest (William Morrow, 1987); The Hammer of the Sun (William Morrow, 1988). 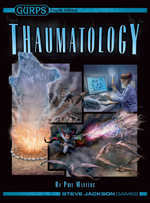 The "Winter of the World" trilogy features magic in the form of powerful artifacts, some of them incorporating anachronistic technological principles. The hero is, appropriately, a magical smith. Vance, Jack. The Dying Earth (Underwood-Miller, 1994); Rhialto the Marvellous (Underwood-Miller, 1984). Two very different but equally rich views of magic in Vance's far-future "Dying Earth" milieu. The setting is also the subject of a fine roleplaying game from Pelgrane Press. Buffy the Vampire Slayer (Various directors, 1997-2003). Teenage TV soap opera about fighting monsters and facing death, which eventually came to include an extended treatment of magic as dangerously tempting power. Prospero's Books (Peter Greenaway, 1991). Idiosyncratic film adaptation of Shakespeare's The Tempest includes a view of the world as it appears to an archmage, full of spirits and subservient to a trained will. 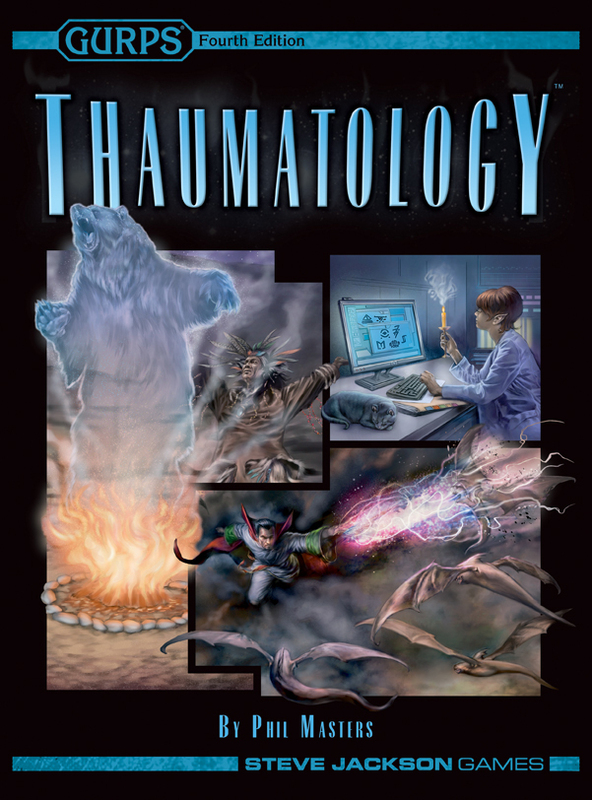 The primary RPG references for Thaumatology were previous GURPS publications, but many other games were inspirational. Brucato, Phil, et al. Mage: The Ascension Revised Edition (White Wolf, 2000). Final incarnation of White Wolf's game of modern dark fantasy and malleable reality. Numerous spin-offs and supplements for this and earlier editions developed the core ideas in many directions. Carella, C.J. Buffy the Vampire Slayer Roleplaying Game (Eden Studios, 2002). Adaptation of the TV series, complete with a nifty simple-but-effective improvised magic system that receives further attention in The Magic Box, by John Snead (Eden Studios, 2003). Chart, David. Ars Magica Fifth Edition (Atlas Games, 2004). Latest version of the classic game of flexible medieval magic, originally created by Jonathan Tweet and Mark Rein-Hagen. The Mysteries, Revised Edition, by Neil Taylor and Christian Jensen Romer (Atlas Games, 2006), adds further mystical subtleties. Pondsmith, Michael Alyn. Castle Falkenstein (R. Talsorian Games, 1994). High Victorian steampunk fantasy (later adapted in a GURPS Third Edition supplement), with a colorful ritual magic system. The Book of Sigils, by "Anthony Savile," et al. (R. Talsorian Games, 1995), expands this. Shomshak, Dean. The Ultimate Mystic (Hero Games, 2004). Extensive treatment of how to incorporate a wide variety of magical styles into Hero System games. Stolze, Greg and Tynes, John. Unknown Armies (Atlas Games, 1999). Magic as a product of obsession and meaning rather than scholarship or talent.